In 1 Corinthians 9-12, Paul seems to talk about a little bit of everything. He reminds the Corinthians of the Lord's Supper and it's sacredness. He brings up the old days of Moses and the Israelites and the Lord's ability to test His people and reward faithfulness. He discusses our freedom as believers and the tradition of covering one's head in worship (an interesting conversation). In the end, Paul tries his best to convince the Corinthians that they all have important and necessary roles in the body of Christ. I love Paul's description of God's gifts for each of us. It makes sense, since the Holy Spirit is the giver of my gifts and/or services, that I should also look to be guided by the Holy Spirit concerning those gifts. I am posting this reading a little late, but better late than never. In 1 Corinthians 5-8, Paul is still talking to the church in Corinth. It seems many of the people have gone in directions that are not good for their faith. Sexual immorality, idolatry, greed, drunkenness, and bad lawsuits among believers are a few of the issues at hand. Paul is trying to caution people and encourage them to make healthy choices that draw them closer to God. When I first started reading this I got a little tense. It just felt like Paul was being a little "preachy" at times, trying to convince me to follow a bunch of "do's" and "don'ts." Then I realized sometimes I need just that. We all need some blunt, to the point correction at times when we are really missing the point in our faith. It's that time of year. I'm talking about Thanksgiving; but if you set foot outside, you might be a little confused. That's certainly understandable. After all, I've been to the grocery store six times this week. Hustling and bustling is how we seem to be rolling. Traffic jams, crowded parking lots, and not enough parking spaces become the way it is these days. With every trip, I pass the beginnings of decked halls. I turn on the radio and the music world is starting to fill the airways with Santa Claus coming to town and jingle bells. Elves are popping up in houses and kids are quickly filling up their Christmas lists. Festive lights are already brightening the night skies! Let me just be honest. These symbols of good tidings are starting to stress me out. I can't help it because I haven't had a chance to celebrate Thanksgiving yet. When I see the sea of red and green, my mind starts drowning in all the things I have to do to get ready for the holidays that I HAVEN'T DONE YET. I begin to feel overwhelmed. I get tense and nervous that I haven't done enough at this point, that I won't be able to get it all done in time. Before I know it, I am stuck worrying about my tomorrows. Yep. Holidays are funny, really. We assign ourselves certain dates to do what we should do everyday. I am not suggesting we eat holiday-style every day, of course. I am just saying holidays are a time we mean to stop, enjoy, and be appreciative. Yet, if we aren't purposeful, holidays easily become another giant distraction, an item on our to-do lists, another part of our routine from which we so desperately need a break. I fight it year after year. Here's the truth. Holidays aren't about the glitzy decorations, the place settings of fine china and polished silver, the clean house, the stylish outfits we wear, or the deliciousness of the food we eat. We hear more from Paul in 1 Corinthians 1-4. He writes a letter to the church in Corinth. It seems the people have become a little lost. They are not getting along. Their hearts are not in the right place (with Jesus). Selfishness and self-righteousness are taking over. Members are going their own ways instead of growing in Christ. Paul writes to encourage them and give them a little wake-up call. He reminds them of their beliefs and hopes to inspire them to draw on the strength and unity they have in Jesus. Even though Paul writes to a church in Corinth way before my time, his message is just as relevant today. The issues and weaknesses Paul addresses are timeless. Not only do Paul's words apply to churches (as congregations), but they also apply to me as an individual who believes. We all get a little distracted, even completely lost sometimes. It happens way too easily right before our eyes, and we don't even realize it. This world we live in is crazy like that. All of a sudden we just know in our hearts things don't feel right. They don't look right. We become unsettled and restless. 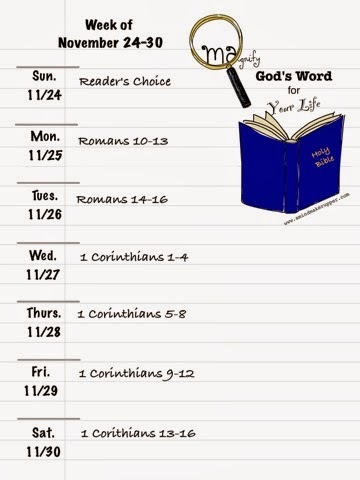 We finish up another book in the Bible with Romans 14-16. Paul explains that our faith is very personal. And, our relationship with Christ is a two-way street. Christ accepts us and loves us for who we are. So, we are supposed to love and accept others in the same way. That is no small task. We each have our own special relationship with God to help us. It's the one relationship, as long as we nurture it, that is certain to give us all we need. We live and die to serve and glorify Him. He fills us with His blessings when we live for Him. And even after death, His blessings do not stop. We have a promised happily ever-after waiting for us in Heaven. I will say it again and again and again. The more we give ourselves to God, the more He is able to do in us, through us, and for us. Little things or big, God is all around us. He's In the everyday, familiar moments and the new and exciting moments. He's even in the most unwanted and difficult moments. His love, His peace, His joy, His power- all here for each of us in every moment of every day. Will I be too busy or tired, too distracted or hurried, too selfish and self-sufficient to notice Him? Or, will I look for Him and find Him in all His glory? Thank you for Your Holy Spirit that is at work in me. Forgive me for so easily falling into the habit of being so self-sufficient that I miss You. You are everywhere I am. I pray you will help me focus on the blessings that You pour into my life every single day, no matter what the circumstances. Fill me, Lord, with your joy and peace and hope. I trust You. What happens when you read the Bible? Whoever you are, wherever you are, however you are, God has something to say to you. I want to invite you, even challenge you. Read and see. Thank you loving me. Thank you for loving me so much that you want to fill my life with your grace and joy and peace. Speak to me through your Holy Word and guide me with your Holy Spirit. Inspire me to nourish my relationship with You in new ways. Paul gives us more on how to live in our faith as Christians in Romans 10-13. God brings us to Him through our hearts. We claim our faith in Jesus, but we do so because of God's call, His work in us. It's that still, soft voice pulling on our heartstrings. Anyone, anywhere who claims Jesus as Lord and Savior WILL be saved. Paul knows, too, we need constant reminders that we are saved by God's grace, not our own mindful doings. And because God so loves us, the most important thing we can do for Him is love and serve each other with the gifts He gives us. Paul is talking about God's life changing stuff. It's Good News for believers. It's also humbling. Yes, I am "A Mind-Maker-Upper." I have made up my mind to live for Him. I choose God over my own limited understandings. I trust Him in all situations. I am deciding to seek Him and find Him in all circumstances. I know I am very far from perfect. I know I mess up all the time. I know I fall-short often. I know I completely fail sometimes. I also know, most importantly, that I have to thank God in all things. I thank God because, it's by His grace, I am saved from myself for a greater purpose- His purpose. God powerfully uses all my steps, even my missteps. That's where His joy comes in and makes it all worth it. I owe it all to Him who blesses me immeasurably more than I could ever imagine. How about you? Are you "A Mind-Maker-Upper?" 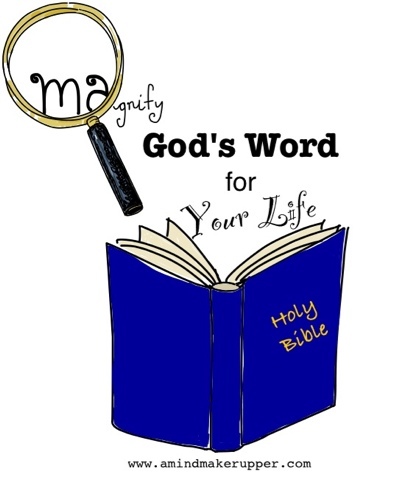 What does that mean in your life with God? I thank you for your sovereignty in all things, especially my own life. I thank you for all that I am and all that I have. Help my mind to stay focused on You in all my circumstances. What do I need to do for You, God? I am Your work-in-progress. Keep me. Change me. Use me. I love you, Lord, with all my heart, with all my soul, and with all my strength. We hear more from Paul as we begin reading Romans today. This man really has a way with words, doesn't he? He writes to the Roman Christians on his way to Spain even though he had never met them. He's so good at encouraging people in their faith and explaining God's grace through faith. We can learn so much from Paul. We finish up Luke's book of Acts, as we read chapters 26 through 28. Just when I think Paul has really done it this time, God swoops in and saves the day. Paul seems to be like a cat with nine lives. He continues to share Jesus' story and God's work in his own life. Through trial after trial, prison, stormy seas, and a shipwreck, Paul continues to bring others to Christ. God is with Paul, and He takes care of him every step of the way. Paul finds himself in the middle of a storm on a boat. It reminds me so much of the story in the gospels when Jesus calms the storm with the disciples. It's a very scary situation. Things don't look good. And then, God shows up, in all His power and glory, and takes care of everything. Paul's close relationship with God, encourages and comforts others at one of the scariest points in their journey. Paul is a troublemaker for the Jewish leaders in Acts 23-25. He is brought to trial, in fact. His accusers are confident the truth about Paul will prove his guilt. Paul, in their opinion, is wrongly turning their laws upside down. The truth (even though Paul does jail time) sets him free. Those who hear Paul's side of the story have a hard time finding any guilt. And in trying to quiet Paul's voice, even more people are drawn to his story. He continues to win hearts for our Savior. How does he do it? How does Paul stand all the trials he faces? Acts 20-22 is tense. Man. It reminds me so much of the time in Jerusalem right before Jesus is murdered on the cross. Paul has spread God's Good News of grace to so many Gentiles. He has never been closer to God. Paul is in the hot seat, and he knows it's about to get worse even before it happens. Paul prays, and like Jesus, spends time with his closest friends. I am amazed at how Paul uses his bad situation, yet again, as an opportunity to share what God has done in his life, shining some light on the power of God's grace. Paul recalls what God did for him. God worked Paul's past mistakes for His good purpose. Paul's baggage shows God's extravagant love and power. God wants to do the same for all of us. Paul's determination and faithfulness get him into all kinds of trouble in Acts 17-19. He is trying to reconcile the Old Testament Law with God's saving grace we now have in Christ. The trouble seems to spread to many who choose to support his ministry. Paul's strongest resource is God's word, the truth. The news is good, but not everyone has heard the full story. And when Paul shares it, not everyone believes it. That was then, in Bible times, and we still face the same reality today. Funny how truth works. The truth will set you free. And as Paul and his crew find out, it can also put you in the middle of a mess. The Good News just keeps spreading in Acts 11-13. Saul (also known as Paul) and Barnabas baptize more disciples at Antioch, and they call themselves Christians for the first time. Meanwhile in Jerusalem, tensions are rising for Jesus' followers. James is killed, and Peter's strong voice lands him in prison. Miraculously, by the grace of God, Peter escapes prison and wins even more hearts for Christ through it all. Disciples are traveling all over the place, doing things they could not have imagined. missionary and witness for Jesus, and it rubs off on people. Just look at what he is doing. He follows God's call to preach in far off places in the Jewish synagogues. I know, as Christians, we are called to be "witnesses" for Christ, but something about that word has always made me a little nervous and shy. And don't you know, there's nothing more discouraging than a bad "witness!" Today, I want to spend some time visiting my friend (and fellow blogger), Courtney over at A Work In Progress. I love her thoughts from Friday. Simple. True. Beautiful. I've tried to write about it, but it's rambling and boring and the details don't really matter. What matters is that on Thursday morning I woke up and literally wrote to God, "Thank you for the stresses of the week. They bring me closer to you." I really, truly meant it. I sort of had this light bulb go on that, Hey, at least I can go to God about all this. And what do you know? Thursday turned out all right. It was a gift because it was back to ordinary, but I had more love in my heart. I had more patience with my kids, and I found myself with this weird thing called time on my hands. I got to one place early, and then had thirty unexpected minutes of free time for one more fun(ish) errand. Sure I forgot my checkbook later and there were plenty of brotherly squabbles to referee, but somehow, it was all better. So if you've had a few bad days, really serious bad days or just the usual life stuff, sometimes it helps to find a quiet place. Put your elbows on the table. Open your palms and say, "Lord, I give it to you. And thank you even for this . . . stuff. Because at least I'm sitting here talking to you. Now, please show me what to do next." God's grace is so beautiful, isn't it? As many of you know already Seth Adam Smith got me thinking with his viral post, Marriage Isn't For You. I loved it. Smith inspired me to write more on marriage in my response post on Friday, Marriage Isn't For You. Me Either. 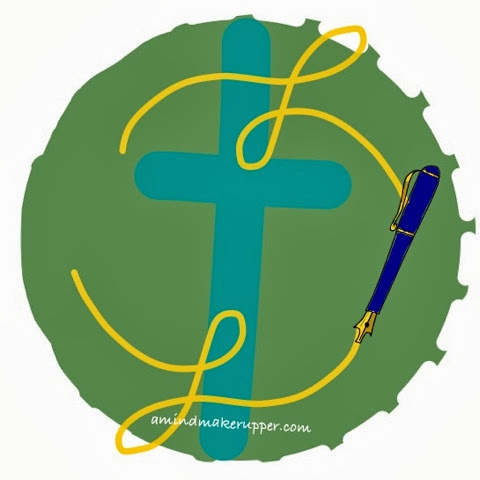 And just as I am growing in my faith, I am also learning so much as a blogger. There's so much to learn! After lots of feedback from my marriage post on Friday, I realized many people don't know that the green font on my blog is a link. That means that you can click on anything green in one of my blog posts, and it will take you to some more, also important, information. I link to websites, blog posts, Bible verses, and even previous posts by me that I think add to what I am saying. So, if this link clicking thing is new for you, feel free to give it a try. Here's a link to my post, Marriage Isn't For You. Me Either. Once it takes you to my post, try clicking the green link to Seth Adam Smith's article, Marriage Isn't For You. It is the background that inspired my post. It's well worth reading. Don't forget to come back and hang out with A Mind-Mind-Maker-Upper after you're done checking it out. Okay. Back to marriage. Words are powerful. So are pictures. 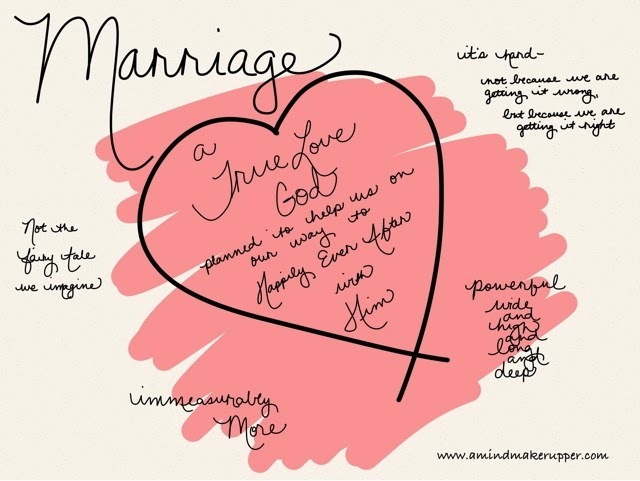 I took what was on my heart about marriage and tried to make a visual too. And guess what? The picture is a link. If you click on it, it will take you to my post from Friday! Thank you for all that you teach me, and all the ways you guide me in my day to day experiences. Help me to hear your voice and follow You. Use me to share your love with others. The disciples are helping more and more people believe in the Lord. I think that's what Jesus wants us all to do, really. The apostles share their stories, their experiences, and they are not afraid to give Jesus the credit. Peter becomes such a strong leader in his faith. It's an amazing change. It's pretty awesome to watch the Holy Spirit at work in believers' lives. I love how God uses ordinary and unlikely people like you and me for amazing things. Acts 1-3 marks the beginning of Luke's second book in the New Testament. Forty days is significant again in the Bible, as Jesus appears to the disciples this long preparing them before He goes to Heaven. A close follower of Jesus named Matthias is chosen to replace Judas Iscariot, who betrayed Jesus. The Holy Spirit fills Jesus' disciples and followers with a violent wind on the day of Pentecost, and the church begins. The disciples are now apostles, and they go into the world to share Jesus' message. It doesn't matter how many times I read it and hear. What Jesus does for us is amazing. Because of Him, we are all brothers and sisters in Christ, one big family of believers. And not only that, Jesus asks us to talk to each other about our walk with Him. In John 16-18, Jesus is basically setting himself up to be able to say "I told you so" in order that people realize He is good for His Word. He wants us to know beyond a shadow of a doubt that He comes from our Heavenly Father, and His power is one and the same as God's power. Not only is Jesus telling the truth, He is the truth by which we are called to live. He tells His disciples what will happen before it happens, and helps them understand the amazing change that follows His resurrection. His sacrifice for our sins means we are forever united with God, Our Father. I don't know about you, but as I read through the Bible and God's word for His people, I have felt separated from Jesus some how at times because I was not one of God's original chosen people around the days of Abraham and the Israelites or one of Jesus' original disciples or apostles in the New Testament. I desperately want God's Word to apply to me. The scriptures are so promising and powerful and full of love. I don't want to be left out. Silly, I know because I do know better. These are just my honest and imperfect thoughts. What do you think? God's Word is full of surprises for me today. In John 10-12, Jesus follows up his teaching about healing the spiritually blind with a discussion of The Good Shepherd and His sheep. I have to admit, I got ahead of myself at first because I thought I knew what I was going to read. We've heard about this in the gospels many times. We are the sheep. Jesus is our Good Shepherd. John's gospel surprised me, though, because Jesus reminds us that He is also the gatekeeper, the one and only way way to our Heavenly Father. And if we want to get to Him, we have to go through Jesus to get there. Then, Jesus surprises me again as I read how He raises Lazarus from the dead. Jesus is the Son of Man and the Son of God. That’s what He wants us to come to understand in our relationship with Him. He is responsible for our eternal connection to God. He tries His best to explain just that in His is own words in John 8-9. I don’t know about you, but everywhere I turn I feel like I am running into bad news, tragic stories, hard circumstances, unbelievable struggles people are facing. My heart breaks to see such horrible things happen to so many good people. Even harder, are the innocent children who are not exempt from suffering. We’ll never know what it’s like to walk in another’s shoes, but for sure we are all fighting our own battles. And it’s very clear, some have to fight more, fight harder, fight longer. It’s impossible to understand. It makes me count my blessings. When Jesus heals the blind man in today’s reading (John 9), He reminds us that the man's lack of sight was not because of anything he did. As John 6-7 shares more about Jesus, we begin to grasp His all-powerful sovereignty in our lives. We know God has sent Him for us, and we see the tension rising between those who believe Jesus and those who do not. Without needing introductions, Jesus just knows His followers completely. There is nothing we can hide from His love for us. He speaks to us more and more as we read. He clearly sees the big picture, the works He is going to do even before they happen. And the best part of all, Jesus promises that He will never leave us. you want to run? Does messing up scare you? Do you fight change because you are afraid of not knowing what's ahead? Are you unnerved at the thought of losing control? Do you steer clear of trying something new because failure makes you way too nervous? Do you want to avoid the word "sin" at all costs for fear that it might actually apply to you? Do you feel the need to justify and explain yourself? Who likes being wrong, right? It's okay. I catch myself answering "yes" to these questions in the middle of my crazy life over and over gain.